Designing an award-winning annual report for a world-renowned hospital. Each year the Hospital for Special Surgery (HSS) tops hospital rankings by U.S. News & World Report — #1 in Orthopedics and #3 in Rheumatology in 2018 alone. 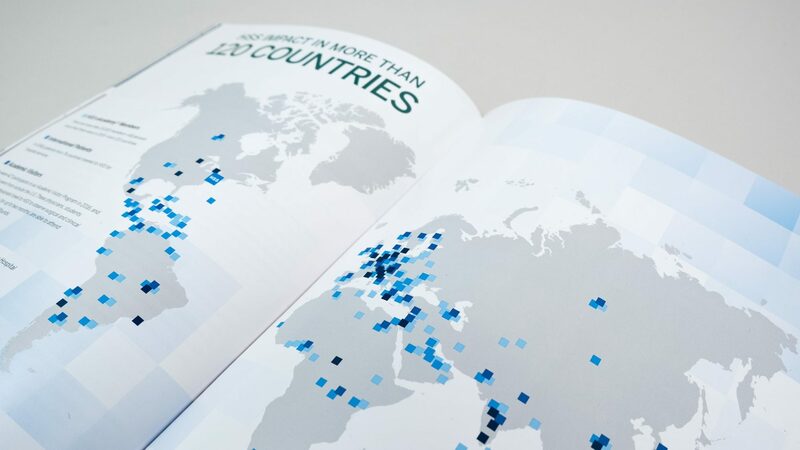 To convey the leading role the hospital plays in modern medicine, from treatment to research to global influence, HSS came to Suka to create their signature marketing piece: the Horizon annual report. 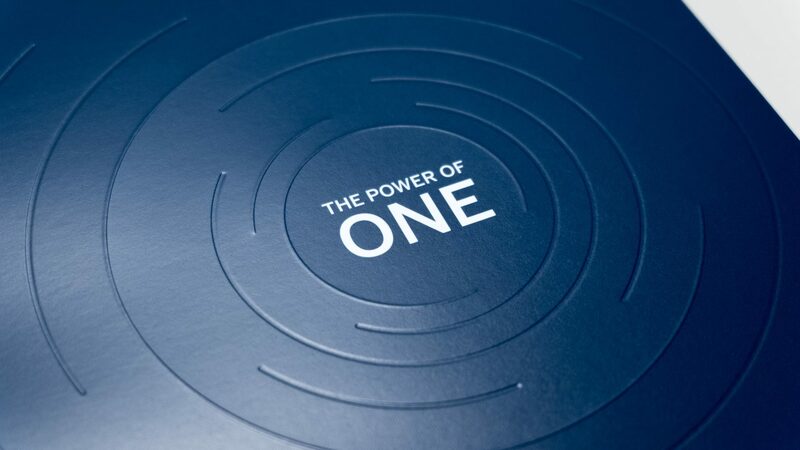 Titled “The Power of One” by HSS, the report had to embody the Hospital’s unified vision of care and the impact of their multidisciplinary approach. 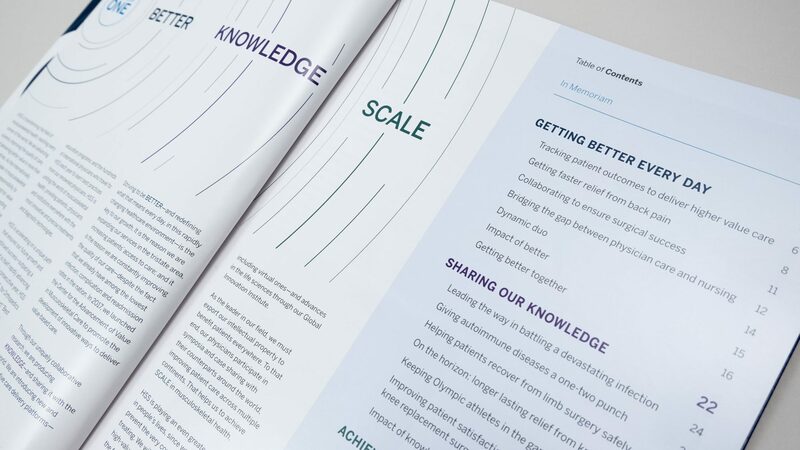 Suka developed a simple but powerful organizing principle to guide the report’s creation: “Ripple.” This simple concept drove the strategic and aesthetic development of a modern, sophisticated report that engaged readers and articulated the Hospital’s expanding impact across the globe. This impact is literally the “ripple effect” that begins with the Hospital’s extraordinary work in New York City. 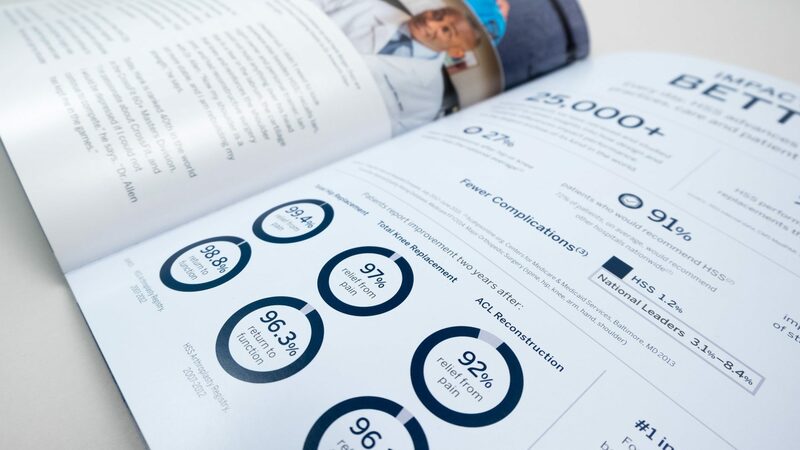 In collaboration with the Hospital’s marketing team, Suka mapped the content flow of the stories and developed strategies for supplementing the copy with commissioned photography, customized maps, and unique infographics. As stories unfolded in the report — from patient care to medical advancements to international collaboration — HSS’s unique impact, the “ripple effect,” became clear. 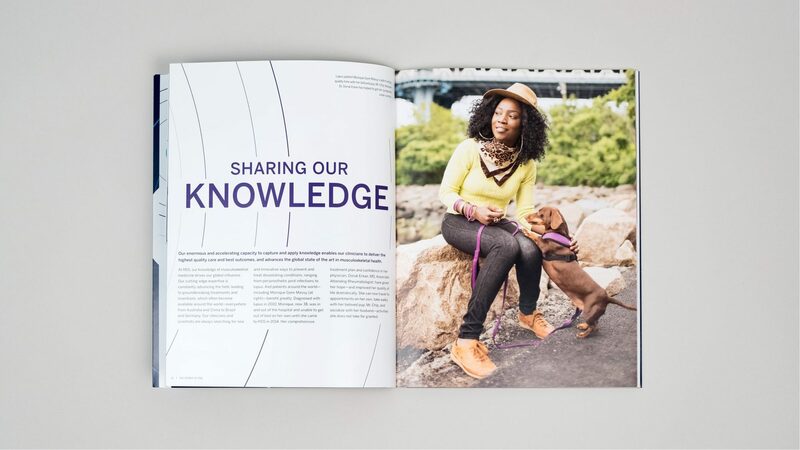 Aesthetically, the annual report had to exude the Hospital’s leadership, innovation, energy, and above all, impact. To capture these qualities, the core HSS brand had to be refined into a cleaner, more sophisticated presentation. 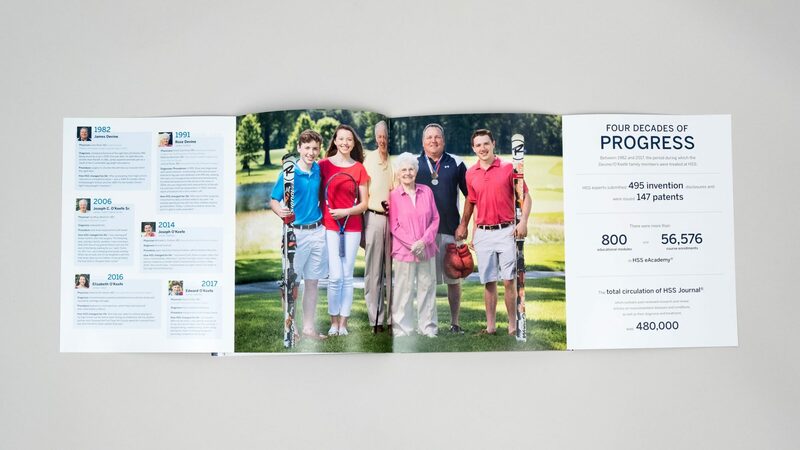 We drew out the essential elements of the brand and designed new graphic elements unique to the report to elevate the publication. We also managed the printing and binding process, using a high-end paper stock and a custom multilevel emboss/deboss effect on the cover to convey the stature of the Hospital. Suka also art directed all of the report’s photography to ensure alignment between content and design and to support the report’s objectives. The photography maintained a personal, journalistic quality that conveyed impact and resonance. The 2018 annual is the longest annual report that HSS has produced. Since its publication, it has received a Platinum award for annual reports by the League of American Communications Professionals and Gold for annual reports by the Aster Awards, both the highest distinction.